Ice cores offer a window into the history of Earth's climate. Layers of ice reveal past temperatures, and gases trapped in bubbles reveal past atmospheric composition. 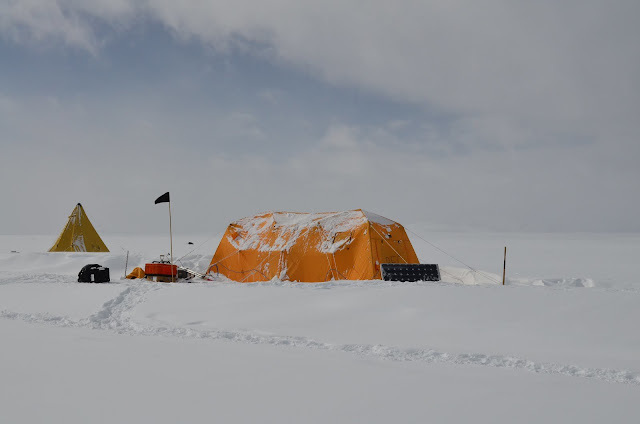 The oldest continuous ice core so far comes from Dome C in East Antarctica and extends back 800,000 years. The Allan Hills has older, blue ice exposed at the surface. Researchers towed their instrument on this wooden sled. 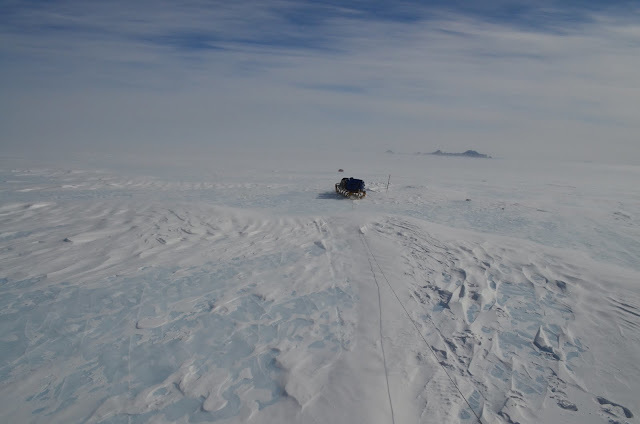 "There's a strong desire to push back the date of the oldest ice core record, to better understand what drives natural climate changes," said Laura Kehrl, a UW doctoral student in Earth and space sciences and corresponding author of the recent paper in Geophysical Research Letters. "The Allan Hills has been an area of interest since the 1970s, when scientists started finding lunar and Martian meteorites that had struck Earth long ago. Now we're discovering its potential for old ice." The team gathered observations in Antarctica's Allan Hills Blue Ice Area, named for the blue ice that is exposed at the surface when ice above gets vaporized. This windy, desert area gets less than 1 centimeter of snow accumulation per year. "A primary reason to seek such old ice is to understand one of the major puzzles of climate system history," said second author Howard Conway, a UW research professor of Earth and space sciences and UW's principal investigator of the project. The puzzle, he explained, is why Earth switched about 1 million years ago from having ice age cycles about every 41,000 years to every 100,000 years. Marine climate records show this switch occurred but they do not resolve details in the atmospheric composition 1 million years ago that might explain the cause. A snowstorm interrupted the fieldwork and left the researchers confined to their field camp for three days. The UW and Maine team has submitted a follow-up proposal to the National Science Foundation to drill the core. Kehrl says it's "not unlikely" that they would retrieve an undisturbed record back to 1 million years. An added benefit of drilling here, she said, would be to learn the history of the Ross Ice Shelf and whether it has collapsed in the past, and how that corresponded to carbon dioxide levels in the atmosphere. "Regardless of whether the million-year ice is there, the record is likely to be valuable," Kehrl said.